This folder contains various items about vinery and the Commonwealth, as retrieved by Alan during his quest to make sense of the contents in the now-vanished farmhouse (see The Viner Dimension). 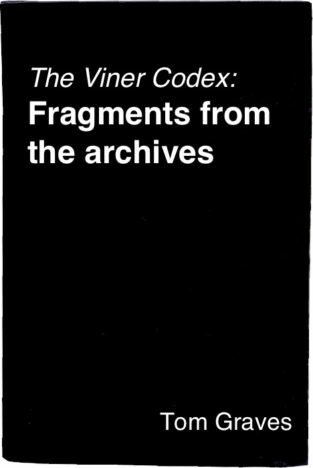 Note: This is a free add-on to the Viner Codex series, to provide more of the background to the stories and their context. Click on ‘Read the book’ to read the current content. This folder contains fragments retrieved and selected by Alan from the Devine Archives (see The Viner Dimension). It includes photographs, illustrations, reports, book-extracts and other items about vinery and the Commonwealth, discovered during Alan’s quest to make sense of what he found in the now-vanished farmhouse and beyond. Further items will no doubt be added to the folder as Alan’s quest continues.